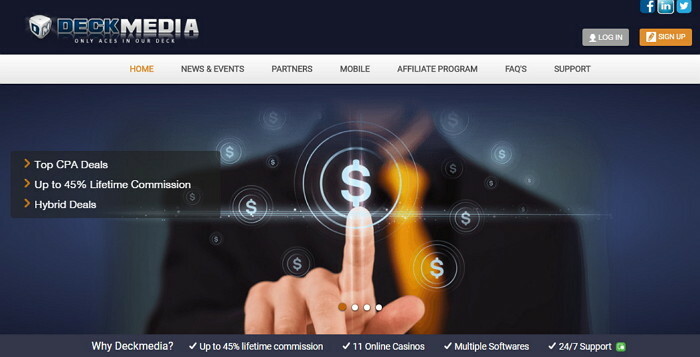 DeckMedia is one of the US-friendly affiliate programs that has become a major player in this industry following the taking over of AffiliateWide’s brands, Box24 Casino, Black Diamond Casino and Spartan Slots in November 2012, adding to their already impressive collection in the likes of Sloto’ Cash Casino, Desert Nights Casino and Miami Club Casino. The last is in fact one of the few representatives of the WGS Technology software, which should add a liittle bit of diversity for affiliates and players. Each of DeckMedia’s brands comes with an unique interface and a solid support & retention program, that not only attracts new players but actually makes the already existing players play more frequently. One negative aspect might be the fact they don’t really seem to offer a CPA plan, but their standard one starts at 30% revenue share and the best of all, negative balance will not carry over to the next month(s), so the affiliates have the best of chance to make a solid income every month. They are certified by numerous gambling portals and associations, and this is a big step ahead in terms of trust, security and longevity. For every issue you may have, their affiliates managers will be quick to assist you and just in case you need any more than that – there’s always Paul Art, their Marketing Manager, that will talk to you and get you fixed. Payments may not come on the first day of the month, but they always come at around 15th of every month and might happen through one of the payment methods you choose, Skrill, Neteller, Wires and so on. So if you North American markets are strong on your website, you shouldn’t hesitate and contact them for a good deal. Other markets they fancy are the European ones such as UK, Germany, Netherlands, Spain, Sweden, France, Norway, Hungary, Czech Republic, Italy and Turkey but also Australia and Mexico, so plenty for you to choose from and you could target an important portion of your audience.